From June 9 to 18, 2017, chef-owner Yosuke Imada of Ginza Kyubey, one of the most highly regarded sushi establishments in Japan, will showcase his world-acclaimed crafts at Chef’s Table of The Ritz-Carlton, Hong Kong, immersing food connoisseurs in the enjoyment of meticulously fine sushi in a cozy yet elegant setting. 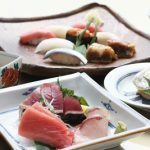 Founded in 1935 by Hisaji Imada, Ginza Kyubey stays true to the flavors of Edomae, the style of sushi from the flourishing Edo period (1603–1868) in the history of Japan. Following his father’s footsteps, Yosuke Imada devoted his teenage years as an apprentice in Kobe and joined Ginza Kyubey in 1965. When the senior Mr Imada passed away in 1985, Yosuke Imada officially took the helm as the second-generation owner-chef. 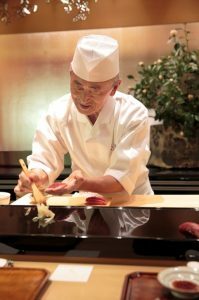 In recognition of Chef Imada’s 50-year devotion to culinary artistry, Ministry of Health, Labour and Welfare of Japan officially named him “Contemporary Master Craftsman” in 2012. The following year, Japanese Prime Minister Shinzo Abe specially flew in Chef Imada to showcase the culinary gems of the country during the Russia–Japan forum in Moscow. Thanks to his unfailing dedication and passion for traditional flavors and techniques, Ginza Kyubey has expanded into a seven-branch sushi kingdom and attracted celebrity guests from around the world including prime ministers of Japan and former US President Barack Obama during his visit to Tokyo in 2014. Throughout the limited pop-up period, epicures in Hong Kong will have an exclusive opportunity to savor Chef Imada’s much-coveted omakase (chef’s choice) menu. Priced at HK$1,080+10% per person, the lunch menu comprises assortments of zensai (appetizer), sashimi, sushi and dessert. Guests looking for a full experience should not miss the dinner menu with a more extensive selection of delicacies as well as yakimono (grilled dishes) at HK$1,880+10% per person. A range of hand-picked chilled and hot sake, and Japanese teas are available to pair with the menu. The pop-up restaurant only seats up to 18 persons. Bookings must be made in advance. For reservations and enquiries, please call (852) 2263 2270 or email restaurantreservation.hk@ritzcarlton.com.